Recent cases of missing radioactive materials in Southeast Asia this year alone vividly highlight the significance of enhancing nuclear security in the region. In Malaysia, a radioactive device was reportedly lost in August 2018 while being transported by two employees of an industrial company that owned the missing device. In the Philippines, an industrial equipment containing radioactive materials was stolen from the facility of a construction firm in July 2018. There were concerns that the unknown amount of radioactive materials contained in the missing devices could potentially emit harmful radiation if handled improperly or be used as a weapon, otherwise known as “dirty bomb”. While nuclear security is often understood to be about securing nuclear power plants and nuclear weapons, it is also very much about the security of radioactive materials. As defined by the International Atomic Energy Agency (IAEA), nuclear security is “the prevention and detection of, and response to, theft, sabotage, unauthorized access, illegal transfer or other malicious acts involving nuclear material, other radioactive substances or their associated facilities”. Although there is no nuclear power plant in the region currently, there is a broad range of legitimate uses of radioactive materials especially in industrial facilities, hospitals, research reactors, and scientific laboratories. Without stringent oversight on the use and handling of radioactive materials, there are potential risks of these being accidentally leaked, stolen and used for malicious purposes, or released indiscriminately by non-state actors. From 2013 to 2017, there were four reported cases in Southeast Asia involving illicit trafficking and theft of radioactive materials. Hence, a key point to note is that the security of radiological materials is an important component of nuclear security. Apart from the immediate impact of a radiological leak, attack or explosion, there are four major non-traditional security consequences associated with a nuclear security incident: health, economic, societal and environmental. Therefore, establishing an effective and sustainable nuclear security infrastructure is crucial for the protection of the state, people, society and the environment. 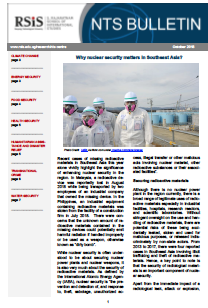 Across Southeast Asia, current gaps in nuclear security governance include lack of funding support to implement capacity-building projects and wide differences in nuclear knowledge and infrastructure among ASEAN Member States. Further efforts are therefore crucial to improve capacity in the least developed Southeast Asian countries. Moreover, several ASEAN Member States have yet to ratify and incorporate global nuclear security agreements into their national legal frameworks. The burgeoning regional cooperation on civilian nuclear energy among ASEAN Member States can help plug these gaps in nuclear security governance. The ASEAN Network of Regulatory Bodies of Atomic Energy (ASEANTOM) has been conducting regular exchanges of best practices, capacity-building efforts, and assistance to member states to implement key international agreements. Indonesia, Malaysia and Vietnam have established their nuclear security training centres. A collaborative network of COEs in Southeast Asia can complement the work of ASEANTOM in terms of sharing good practices, resources, expertise and information. With the ever-present transboundary risks of radiological emergencies and stolen radioactive materials, improving the rate at which security policies are fully implemented and understood by all stakeholders could dramatically narrow the gaps in nuclear security in the region.